Last year Japan introduced one of the toughest laws in the world for dealing with online piracy but with little visible action against file-sharers it was questioned whether the legislation would have teeth. That position has now dramatically switched, with police nationwide carrying out searches on 124 locations and arresting 27 people for online infringement. Those arrested face up to 10 years in jail. Following complaints that the music industry was in peril from the actions of illegal file-sharers, in June 2012 the Japanese government approved an amendment to its Copyright Law that would see mere downloaders of illicit content face criminal penalties. The new legislation, which kicked in October 1 2012, stated that those knowingly downloading copyright infringing material could face a two-year jail sentence or a fine of 2 million yen ($21,640). Existing legislation against uploaders of copyright content already provided for penalties of up to 10 years in prison and a 10 million yen ($108,202) fine. The Japanese public hadn’t witnessed any large scale enforcement action since the law’s introduction nearly five months ago but all that changed a few days ago. The National Police Agency’s Cybercrime Project and rightsholders including the Recording Industry Association of Japan have just revealed the results of an intensive three day anti-piracy crackdown. 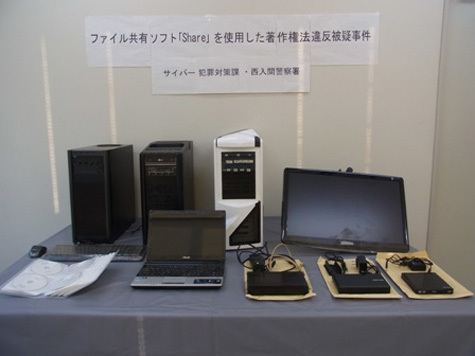 The police say that they carried out raids on 124 locations in all 47 regions of Japan, to date arresting a total of 27 people for breaches of copyright law. The items being shared and/or downloaded unlawfully include movies, music, TV shows, games and business software. The Recording Industry Association of Japan confirmed that at least two of the arrests related to their products. The first concerned a 41-year-old who had allegedly uploaded music using the file-sharing software ‘Share’ and the second involved a 42-year-old who allegedly uploaded a video clip using the same tool. The MPA-affiliated Japan and International Motion Picture Copyright Association (JIMCA) say that a 40-year-old man was arrested February 19 for allegedly uploading copyrighted movies using the P2P software ‘Share’. An earlier raid netted the hardware pictured below. In addition to the above, several other rights organizations were involved in reporting the remaining alleged infringers to the police. They are the Association of Copyright for Computer Software (ACCS), General Motion Picture Producers Association of Japan (MPAJ), Japan Video Software Association (JVA), General Institute of Japanese Society for Rights of Authors, Composers and Publishers (JASRAC) and the Business Software Alliance (BSA).